‘Listen Up’ is the first European conference to be held specifically to discuss how best procedures used to conserve our precious sense of hearing can be developed. 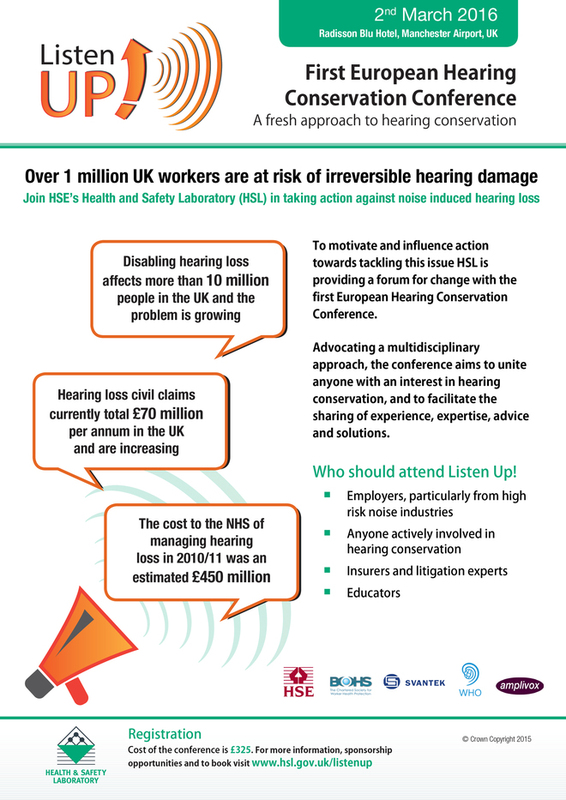 Organised by the UK Health & Safety Laboratory, Experts and interested parties from around the World will be attending, and our own Consultant Audiologist, Rob Shepheard has been asked to make a presentation at the technical meeting on the second day of the conference, discussing how the profession of the Audiologist can become more involved in preventing un-necessary injuries to our auditory health whether you are a musician or working in Industry. By using the techniques and procedures researched by Mr Shepheard and our overseas colleagues, The Preventative Audiologist along with these innovations is now able to make a very real improvements in the world of hearing conservation. If you are a professional interested in the field of hearing conservation please register with the HSL if you wish to attend and see these new technologies in action, however if you are not able to then get in touch with us at Anglian Hearing Healthcare or at HearingCoach to see how we can help you develop your practice and the services you offer.